Vocational Service is one of the founding principles of Rotary: that we know and understand the professions of others, and respect their skills. In turn, we try to build skills in ourselves and in others. 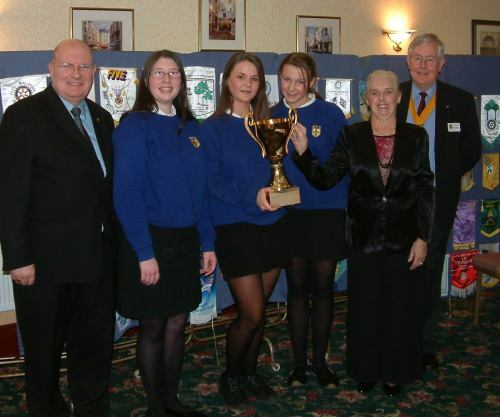 The Rotary Club of Westhoughton interprets Vocational Service through visits to businesses and establishments, and competitions to build skills, such as public speaking. We are pleased to announce that the Rotary Art Competition for primary schools will be held for the second time this academic year (and Rotary year). This is open to pupils in our local primary schools in years 3 and 5. The theme will be set by the Rotary Club, and will be wide-ranging and well known, such as "The Environment" or some international topic. Generous prizes will be given to the winning schools, in the form of a donation for the purchase of worthwhile art and craft equipment. Personal prizes will be given to the winners, 2nd and 3rd places in each year. The Mayor and Mayoress of Westhoughton will present the prizes in February 2009. This is a public speaking competition for secondary school students. 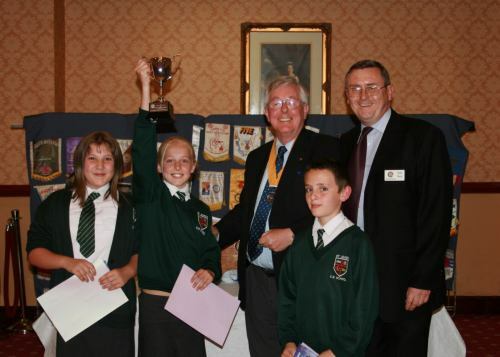 We have been running this very successfully since the 1980s, and the winner of the competition in the Rotary Club of Westhoughton goes to further heats up to District Final and Regional Final level. We normally have entries from Westhoughton High School and St. Joseph's High School and Sports College, Horwich. We have had two winners of the District Final and a third place in the Regional Final. The award to the winner in our Club competition is the magnificant Jack Cowburn Cup, named after a former member, who was the first mayor of Westhoughton Town Council in 1986. This is presented to the winning team by Mrs. Margaret Cowburn. This is a public speaking competition for primary school pupils, which we started in our District in 2002, apart from an earlier competition in the Isle of Man. It has grown bigger and better each year, and there are plans this year to increase the scale to allow more pupils to take part in rounds in primary schools. This picture shows the winning team in June 2007, from St. James School, Daisy Hill. The winning team receives the Gordon Eatock Cup, which is named after one of our former members, himself a primary school head. To celebrate Rotary's Centenary in 2005, we created a new award: the Westhoughton Community Learning Centre Adult Student of the Year. This was given to the person whom, in the opinion of the tutors and staff at the centre, most deserved recognition for their academic achievement in their chosen field of study, often overcoming personal challenges at the same time. We were initially concerned whether the centre would produce suitable candidates, but are now delighted to find ourselves with the problem of picking the winner from a field of excellent candidates. This year's winner is Nicola Lowe. She was presented with a cheque towards her further study next year. 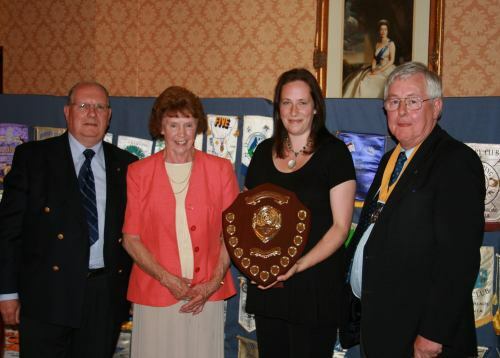 The award is known as the Harold Halliwell Shield, after a much loved past president of the club, who ran a taxi business and was therefore known to everyone in Westhoughton. Mrs. Irene Halliwell is seen presenting the shield to Nicola.